Plans to put a team in New York City were blocked by the NL’s New York Giants, who had enough political power in New York City to prevent the AL from establishing a team. 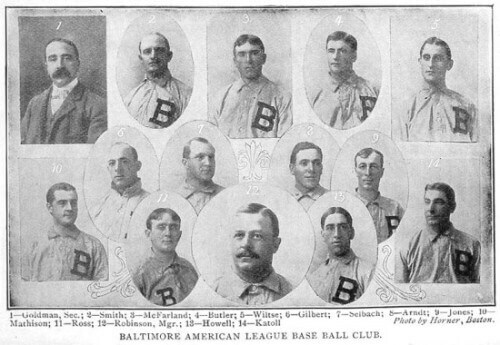 Instead, a team was put in Baltimore, Maryland, a city which the NL abandoned when it contracted from 12 to 8 teams in 1900. Nicknamed the Orioles, the team began playing in 1901, and were managed and owned in part by John McGraw. During the 1902 season, McGraw feuded with Johnson, and secretly jumped to the Giants. In the middle of the season, the Giants, aided and abetted by McGraw, gained controlling interest of the Orioles and began raiding it for players, until the AL stepped in and took control of the team. In January 1903, a “peace conference” was held between the two leagues to settle disputes and try to coexist. At the conference, Johnson requested that an AL team be put in New York, to play alongside the NL’s Giants. It was put to a vote, and 15 of the 16 Major League owners agreed on it, with only John T. Brush of the Giants opposing. The Orioles’ new owners, Frank J. Farrell and William S. Devery, found a ballpark location not blocked by the Giants, and Baltimore’s team moved to New York.